Well, now that you are pregnant and the euphoria has settled down, the next thing you should be doing is to finalize a gynecologist and also, the hospital in which you plan to give birth. In this article, you will find the best tips on how to choose a hospital for delivery. “My pregnancy has been just confirmed. Do I really need to look for hospitals now?”, most moms ask. YES. Finding the right hospital for your baby’s birth is as important as finding the best gynecologist to handle your pregnancy. Both the needs are intertwined as your choice of gynecologist also depends on the hospitals she is affiliated with. How do you go about choosing the best hospital? Should you go to branded hospitals or choose a hospital near you? What criteria should you take into account while choosing a maternity hospital? Once you have chosen the gynecologist you are going to consult throughout your pregnancy, check with her about the hospitals she is affiliated with. This will narrow down your choice to only a few hospitals. The distance of the hospital from your place of residence is a highly important factor to consider while choosing the hospital. Ideally, you should be able to reach the hospital within half an hour even in peak traffic hours. It is best to choose a hospital close by as you would not have to worry about covering the distance or traffic woes when the baby is on the way. Your doctor would have given you an estimated due date for the delivery. There is always a possibility of the baby arriving 2 weeks early or 2 weeks late. So, check with the hospital if rooms of your choice or birthing suites are available during the due month. Some hospitals require you to confirm months in advance that you would get admitted there for delivery. This helps them understand the patient influx and the room availability in advance. Also, check if you can get private rooms or if you ready to share your room with other moms. Many hospitals provide birthing suites which can be used for both labor and post-partum. Your gynecologist may not be available in the hospital 24*7. Usually, hospitals have an on-call or an in-house obstetrician who will be there to attend all emergency cases. 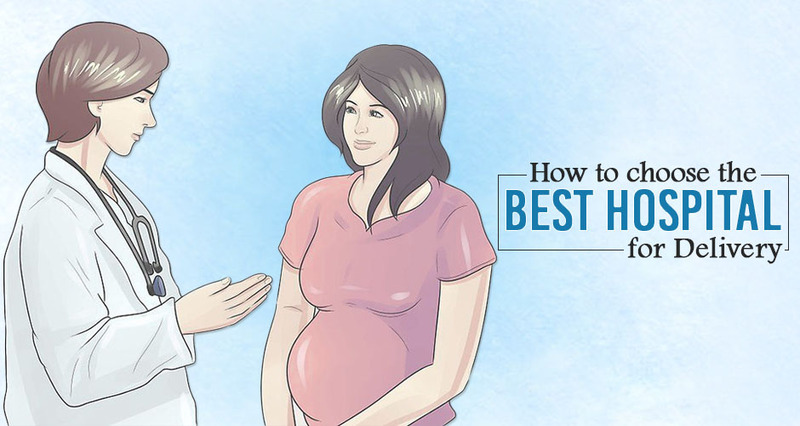 In case your obstetrician is not available at the time of your delivery, the hospital should have qualified obstetricians to handle your delivery and also be able to handle any complications, if necessary. Considering that the nurses are the ones who are going to check up on you, attend to you and even guide you during your stay at the hospital, the quality of nursing staff is very important. The hospital should have an adequate number of nurses to attend to pregnant women and new mothers. The support staff should be courteous and well-organized. There is no point if you have to run around to connect with the doctor or nursing staff or any other facilities. In case, you go into a preterm labor or if you have a high-risk pregnancy or if any complication arises during delivery, the hospital should have adequate facilities and qualified doctors to handle the emergency. The hospital should be able to arrange for blood on short notice, have an Intensive Care Unit (ICU) and operating facilities. It is mandatory that your hospital has a pediatrician on call or an in-house one. In case of emergency, a pediatrician should be present during childbirth. A pediatrician will be able to evaluate your baby after birth and decide how healthy your baby is. In case of preterm birth, the pediatrician plays an important role after delivery in ensuring proper intensive care for the newborn. One of the most important things to look for when After birth, the pediatrician will evaluate the baby and decide if it is fit to be moved into the postpartum ward with you or if it needs to be moved to a NICU. It is always better if there is a NICU in the same hospital you deliver, else the pediatrician might recommend moving the baby to NICU in other hospitals. It would be really inconvenient if your baby is in NICU of one hospital and you recovering in another, especially after a C-section. It will also be convenient for you to breastfeed your baby at regular intervals if your baby is in the same hospital. If you are planning to breastfeed your baby, check with the hospital if they have any lactation consultants / experts. For first time mothers, it is very helpful to have a lactation guide who can help her through latching, breastfeeding positions and also provide other important information on breastfeeding. Childbirth is an important event and no doubt your family members want to be present in the hospital. In case the labor takes a long time or if any of your family members wants to stay back to assist you during labor and postpartum, the hospital should allow and also, have facilities to accommodate them. Nowadays, many mothers choose to store the umbilical cord blood in a cord blood bank. If you are planning to do so, check if your hospital has the facility to store the cord blood or can transfer the cord to a cord blood bank. The above are some factors that you should consider before choosing a hospital to deliver your child. Sometimes, you might not find a hospital which meets all your requirements. In such cases, you can always give priority to factors like distance from home, the presence of NICU, hospital facilities to handle an emergency, quality of nursing and availability of pediatrician. Before you finalize your hospital, you should also check with the hospital about approximate charges for normal delivery and cesarean delivery, and verify if it suits your budget. In case your health insurance provides you maternity cover, then you have to choose from the network hospitals only. You should also check the amount of maternity cover provided by your insurance and choose your hospital and the type of room accordingly. Dear Ladies, apart from all these factors trust your instincts and check how comfortable you feel in the hospital environment. If you feel warm and comfortable speaking to the nursing staff and the support staff, it is a plus factor. Always prefer a hospital which meets your requirement rather than preferring famous and branded hospitals. We hope that this list has been helpful and have answered many questions about how to choose a hospital for delivery.